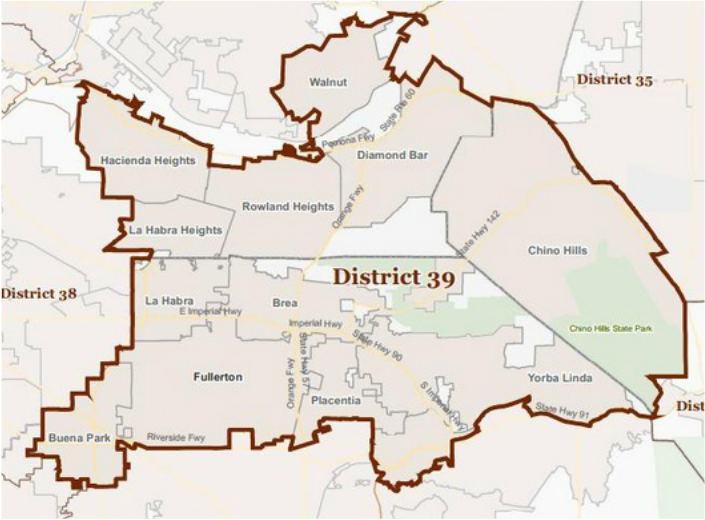 Republican Ed Royce currently represents Congressional District 39. Royce is expected to easily win re-election in 2016. U.S. Representative Ed Royce (R) is serving his twelfth term in Congress and represents California's 39th District, based in Orange, Los Angeles, and San Bernardino Counties. He and his wife, Marie, are longtime residents of Fullerton, CA. Royce's priorities in Congress are: addressing our national debt, protecting our homeland, eliminating pork-barrel spending, fighting crime and supporting victims of crime, strengthening education for all students, spurring job creation and strengthening Social Security and Medicare. Royce has a strong history of public service. In 1982, he was elected to the California State Senate where he began his fight for victims' rights. He authored the nation's first anti-stalker law and versions of his bill have been adopted in all 50 states. He was also the legislative author and campaign co-chairman of California's Proposition 115, the Crime Victims/Speedy Trial Initiative, approved by the voters in 1990. In Congress, Royce continues his fight for victims' rights. He wrote and passed the Interstate Stalking Punishment and Prevention Act in 1996. This law makes it a federal crime to pursue a victim across state lines and enables law enforcement to intervene before violence occurs. Royce was active in passing AMBER Alert legislation in 2003, and legislation in 2004 to enhance rights for victims of crime. He currently is a member of the Victim’s Rights Caucus. For the 114th Congress, Royce was selected to be Chairman of the House Foreign Affairs Committee. Royce has served on the Committee since entering Congress in 1993. Immediately prior to becoming Chairman of the Committee, Royce served as Chairman of the Subcommittee on Terrorism, Nonproliferation, and Trade and a member of the Subcommittee on Asia and the Pacific. For more information on his work on the Foreign Affairs Committee visit: http://foreignaffairs.house.gov/. As a senior member of the House Financial Services Committee, Royce sits on two Subcommittees: Capital Markets and Government Sponsored Enterprises, and Insurance and Housing. Royce has served on the conference committees for some of the most significant legislation in the financial services arena. For more than a decade Royce has called for a stronger federal regulator to limit Fannie Mae and Freddie Mac's excessive risk taking at the expense of taxpayers. In 2003, he was the first member of Congress to write legislation calling for a single regulator under the Treasury Department for the three housing government sponsored enterprises: Fannie Mae, Freddie Mac, and the twelve Federal Home Loan Banks. Royce has consistently earned honors and awards from the National Taxpayers Union, Citizens Against Government Waste, National Federation of Independent Businesses, Watchdogs of the Treasury, Americans for Tax Reform, U.S. Chamber of Commerce, United Seniors Association, 60 Plus, American Share Holders Association, Citizens for a Sound Economy and the Small Business Survival Committee. A California native, Royce is a graduate of California State University, Fullerton, School of Business Administration. Prior to entering public service, his professional background includes experience as a small business owner, a controller, a capital projects manager, and a corporate tax manager for a Southern California company. Royce and his wife, Marie, have been married for 29 years.